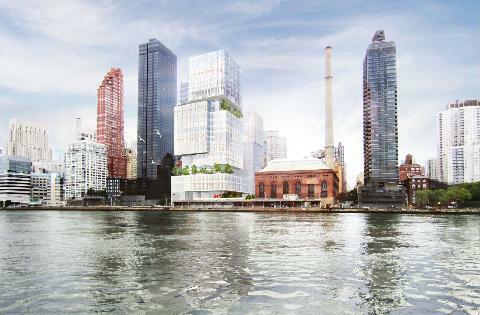 Renderings of the proposed complex at FDR Drive and 74th Street by Memorial Sloan-Kettering and The City University of New York/Hunter College. Image Credit: MSKCC and CUNY. New Memorial Sloan Kettering/City of New York dual educational and hospital facility approved by City Council. On September 16, 2013, the City Council’s Land Use Subcommittee on Zoning and Franchises held a public hearing on a proposal to develop a hospital and educational complex on the Upper East Side of Manhattan. The applicants were Memorial Sloan-Kettering Cancer Center (MSK) and The City University of New York (CUNY)/Hunter College. The project site is located on 74th Street between York Avenue and Franklin Delano Roosevelt (FDR) Drive, immediately north of the “medical corridor,” which includes Cornell Weill, New York Presbyterian Hospital, MSK, and Hospital for Special Surgery. The application would amend the zoning map to convert the current industrial zoning to support community facility development; amend the zoning text to allow contributions to public park improvement in exchange for additional floor area; provide special permits to waive certain height and setback requirements; and provide a special permit to increase the number of parking spaces in the MSK parking facility from 166 to 248. MSK intends to build a new ambulatory care center, and CUNY proposed to build the Hunter College Science and Health Professions Building. According to Iris Weinshall, Vice Chancellor for Facilities, Planning and Construction at CUNY, the proposed site will “allow Hunter to consolidate its related science and health professions programs, including nursing and physical therapy, and provide research labs for its core science department.” Craig Thompson, President and CEO of MSK, stated that MSK plans to use their portion of the proposed site to provide out-patient treatment for patients with hematologic cancers, such as leukemia and lymphoma, and head, neck, and lung cancers, as well as provide radiation therapy and early-stage clinical trials. MSK’s portion of this facility will be approximately 60 percent with a FAR of approximately 8.0, and CUNY/Hunter’s portion will be approximately 40 percent with an FAR of approximately 4.0. Together, the joint-site will be developed to an FAR of 12.0. The 12.0 FAR will include an additional 2.0 FAR requested in the special permit zoning text amendment application. The additional FAR will be obtained through contributions for the improvement of Andrew Haswell Green Park, located between E. 59th and E. 63rd Streets along the FDR Drive. The opening of the park has been delayed for several years because of budget constraints. Council Member Letitia James of Brooklyn expressed concern about the impact the additional construction project would have in a community that will be a “construction zone for the next few years.” Current construction of the Second Avenue Subway and the Hospital for Special Surgery’s project over the FDR Drive are underway in the area. (See CityLand’s past coverage here). Local Council Member Jessica Lappin questioned the reasoning behind the shortfall in the number of parking spaces given projected peak demand of 350 parking spaces for patients and visitors and a projected total of 700 new employees in the fully operational facility. Land Use Committee Counsel Shelly Friedman explained that the number of parking spaces did not trigger an adverse impact under the CECRA analysis because there was sufficient inventory to accommodate future parking needs. Environmental consultant Chi Chan explained that the parking on the site’s facility would be restricted to patients and visitors, and operated by a valet. If the need for parking at any given time were to exceed the number of available spaces in the facility, the valet would find parking for the visitors in surrounding garages. Employee parking, according to Craig Thompson, would be accounted for elsewhere in the community. Thompson projected that a large number of MSK employees would live in the community and walk to work. Others would use public transportation. Council Member Lappin also inquired about traffic impacts in three intersections along York Avenue. Friedman responded that addressing the traffic concerns will require a collaborative effort between long-term stakeholders, and that MSK would be willing to work with any party who wants to sit down and talk about a solution. Residents of Yorkville strongly opposed the proposed project, echoing some of the concerns raised by the Council Members. Several of the speakers argued that the development was too large and traffic intensive for the already congested residential neighborhood that surrounds it. They also expressed concern about the continuous transformation of Yorkville, which will cause the neighborhood to be in a constant state of construction. Some Yorkville residents suggested that the proposed project be built in areas of the City that need hospitals. The City Planning Commission approved the application on August 21, 2013. The Commission found that the application minimized or avoided adverse environmental impacts to the maximum extent practicable. On October 9, 2013, the full City Council voted to approve the application by a vote of 45-1. Council Member Gale Brewer in voted against the proposal. City Council: Memorial Sloan Kettering Cancer Center/City University of New York Joint Project (C130214 ZMM – zoning map amendment); (N 130215 ZRM – zoning text amendment); (C 130216 ZSM – special permit); (C 130217 ZSM – special permit); (C 130218 ZSM – special permit) (October 9, 2013).